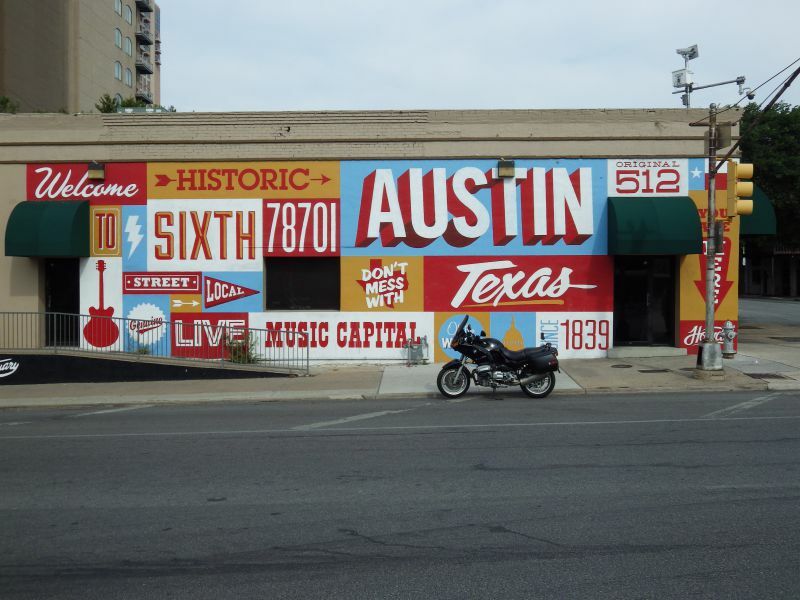 Our plans for July fourth were to meet with the Austin cue crew at John Mueller for lunch and then Leslye and I would ride the bike out to Llano to hit Cooper’s for an early dinner. 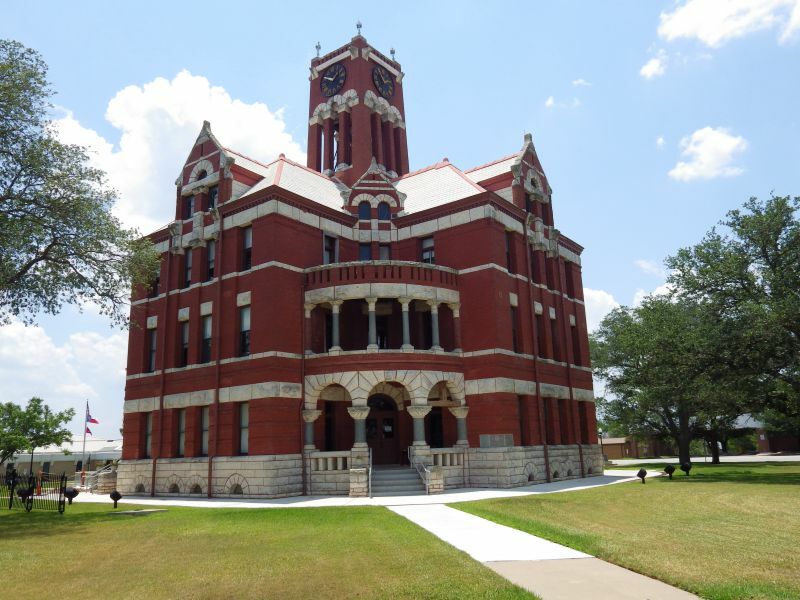 We were staying the night in Georgetown and then planned to stop by Louie Muller and Giddings City Meat Market as we made our way back to Tomball. The full route is shown here and at the bottom of this article. I rode the bike up myself while Leslye drove the Jeep with the boys in it; they would drive back on their own after lunch. In order to deal with the wind noise in our helmets and not drive ourselves silly with boredom we had purchased sets of molded headphones for ourselves. I had tried external speakers with an amplifier but I could barely hear the music over the wind and when I came to a stop at the light everyone around would get to hear my music selection; not something I preferred if the music mix was on Tori Amos or some eclectic artist that I like. I had thought about wiring up an auto-mute that would kick in at certain speeds or even just adding a large switch or button but it still didn’t resolve the problem with wind noise at higher speeds. The next option I tried was in-helmet speakers. These mount inside the helmet and very close to your ear, but not in the ear like ear-buds. It wasn’t a terrible setup, but when I bought a new helmet I couldn’t get the speakers to line up properly with my ears and lost a lot of the volume. The setup requires the speakers to be placed very close to your ears. I had tried an inline amplifier to boost the signal and while it worked with my original helmet it still wasn’t able to provide the amount of volume I wanted. Again I also had problems with wind noise and wind pressure. Regular ear-buds didn’t work well for me, they fell out or moved too easily and to be honest, the ones I used also blocked out too much background noise. Ear-buds can be dangerous and one should have a lot of experience before resorting to them. I don’t use them in the city and if they are in my ears when I get into town I pull them out of the audio jack so that they function only as mild earplugs. Custom molded ear-buds can run $100 and above and I wasn’t even sure if I would like them so I balked at purchasing them. Then I found Fuze custom earphones. These run less than $50 a pair and come with a two-part putty that you mix together and then pack into your ear while the ear buds are in place. After about 15 minutes this putty becomes firm enough to stay in place but remains resilient enough to be comfortable. I had read the reviews and after testing agreed that the audio quality itself was laughable; there was virtually no bass response at all. However, once fitted they allowed me to listen to music while riding and comfortably blocked out wind noise and pressure. Music really helps riding in temperatures reaching 100 degrees as it takes your mind off of the annoyance of the heat. There are also certain near magical times when a song lines up perfectly with the moment. With the earphones in place, a heat-out shirt and skull cap on, and sun sleeves on my arms I rolled out of Tomball around 7am. I made it only as far as the end of the block when I noticed my brake light was sticking on. I got it fixed in a few minutes though and was back on the road just after 7:15. John Mueller’s new joint is like several of the elite BBQ establishments that provide only lunch service; people line up before the 11am opening and the line remains long until they sell out a few hours later. Being July 4th and also being that Franklin BBQ was closed, I didn’t want to arrive too late and find myself in the back of the line. The ride to Austin was uneventful. 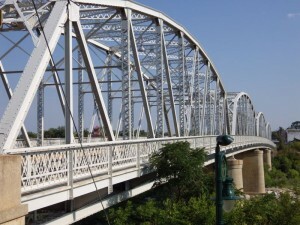 I took Hwy 290 outbound and then TX 21 south to TX 71 where I came into town on the southern side. From there I followed U.S. 183 a short ways to the exit at 7th street. I didn’t ride that exuberantly but got there at 9:30am, well before my intended 10am arrival time. There was only one person in line so I went to fill up with gas and ride around the neighborhood a bit. When filling up, the screen on the gas pump was corrupt and when I thought I hit “yes” for a receipt I actually hit yes for a carwash. I fumed to myself for a moment at paying $8 for a carwash I couldn’t use on the bike but then figured I’d give the code to Leslye for a wash of the Jeep. I got my place in line at John Mueller at about 10th position and in short time Leslye, the boys, and the Austin cue crew showed up including my brother Wayne and his wife Terri, Cory Gregg, Brooke Bitter, my sister Cheryl, and Ernest Ojeda. By 10:30am the line had built up to about 25 folks and stayed somewhere around 20-30 people the entire time we were there. When the gates were thrown open I enthusiastically called out “its brisket time!” My statement was met with a reply from John, “It’s get in line, shut up, and eat time!” Yep, I was at John Mueller’s place. I really like the food at John Mueller and I like the atmosphere as well. 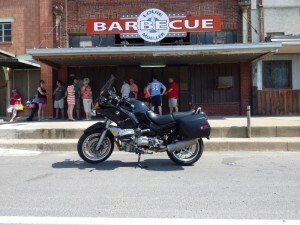 I’ve written about it before and it is still my favorite BBQ joint when you factor in the food and the environment. My first visit was on a Sunday when they offered not just free beer but free vodka screwdrivers and bloody Marys along with the live band. On this day the beer was free, without even a tip jar in site, and the band for the day was Jean Claude Van Jamme. 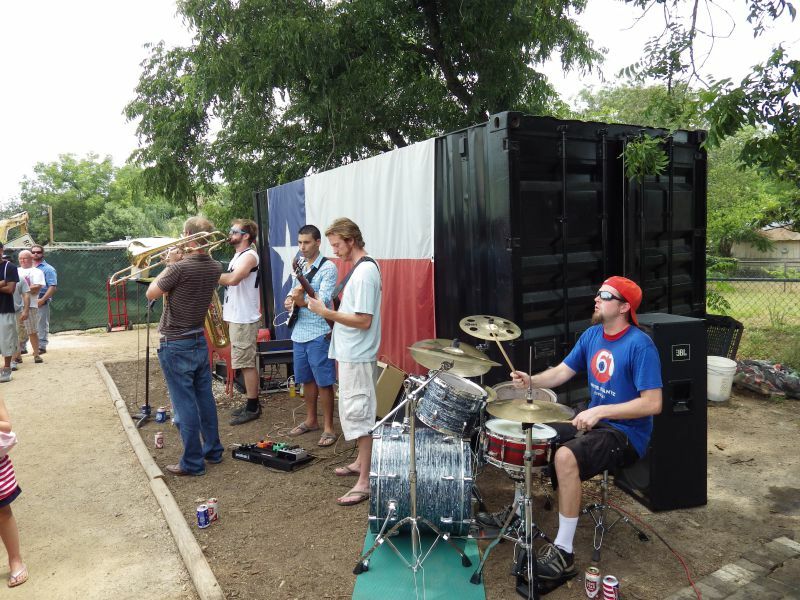 They are a funk band and while initially it took a couple of songs to get into the music, after a couple of Lone Stars I really enjoyed them. 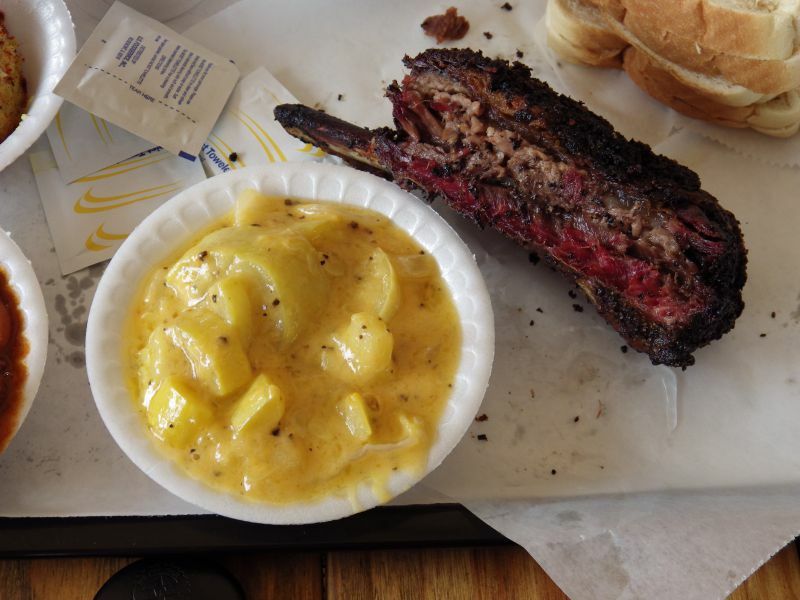 We ordered brisket, a beef rib, and some sides including the squash casserole. I forgot to order sausage but I figured the rib would be enough. Some BBQ joints wrap their briskets before they are done. When they have a few hours left to cook they wrap the brisket in butcher paper, foil, or even plastic wrap and let them finish on the smoker. This seals in the moisture and some swear by the method. 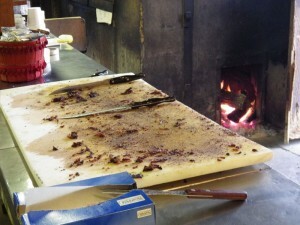 I don’t think they wrap their briskets here, so as a result you get a crispier bark. I’ve seen Mueller carry the brisket from the pit to the trailer and it looks like they are cooked sans-wrap. This is by design though, and once you get past that bark it’s all moist goodness. 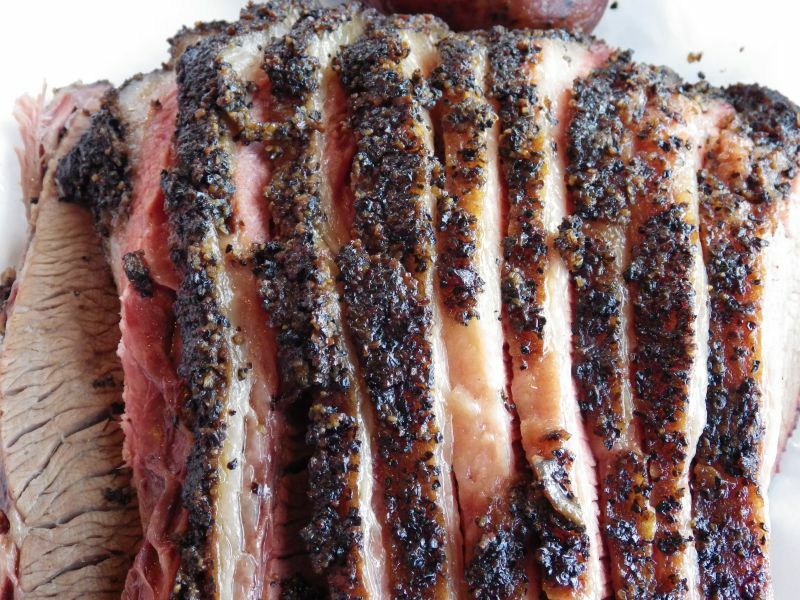 I love the bark though, especially on a good fatty piece where you get that strong hit of kosher salt and lots of pepper with a little crispness followed by perfectly rendered fat and flavorful meat that mixes into such a wonderful taste. I still like bark from briskets that are wrapped, but I enjoy the variety as well. Some folks may get turned off due to the crispier bark here but it is by design. The beef rib was similar to the brisket; it had a nice crusty bark with dark smoke ring and delicious beef. It was a little smaller than the giant ribs at Louie Mueller, but was still healthy sized. Shawn felt that Louie Mueller’s was the best rib so far, with Black’s behind it. He didn’t leave any meat behind here though! Leslye and I liked the potato salad, which had a nice color and good flavor. I really liked the ranch style beans. They were heavy on salt and spice but had a nice dark red color and thick texture. They were a little too salty for Leslye but I really dug them. I got the squash casserole again and it was just as good as the first time. The atmosphere here wins me over every time. The live local music, the beer, even the crowd seems more fun than other joints. 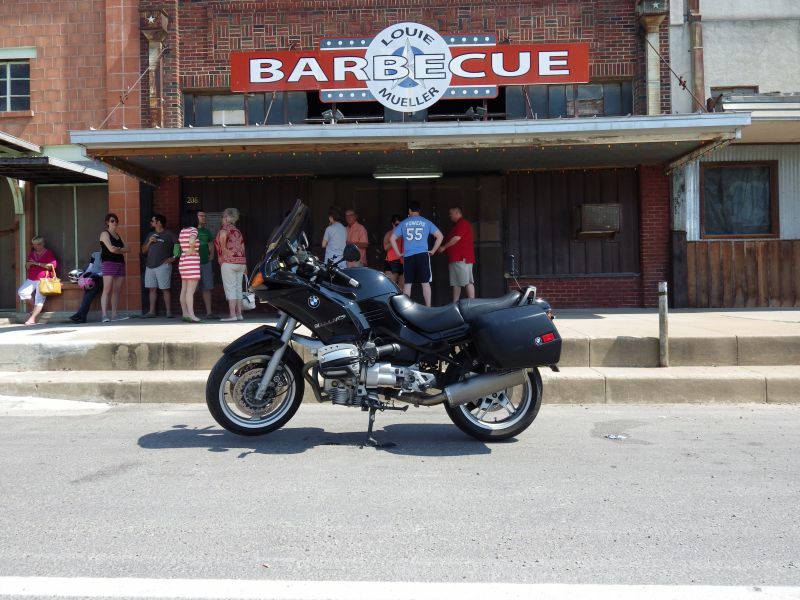 I don’t get any points in the Biker Monkey BBQ challenge for eating here, but I’ve been twice already in the last couple of months and will be back. Speaking of atmosphere, my brother and sister wandered over near the pit while we were towards the end of our meal. My sister started asking John Mueller some questions, and my brother wanted to check out the pit. My brother is a welder by trade and was interested in the design of the pit. One of several things I have learned about John Mueller is to leave him alone while he works. They annoyed the man long enough for him to comment that he doesn’t come and bother them at their work – I was just glad he didn’t ban us from coming back! I think they learned their lesson. While they were bugging him he was still prepping fresh food for the smoker. 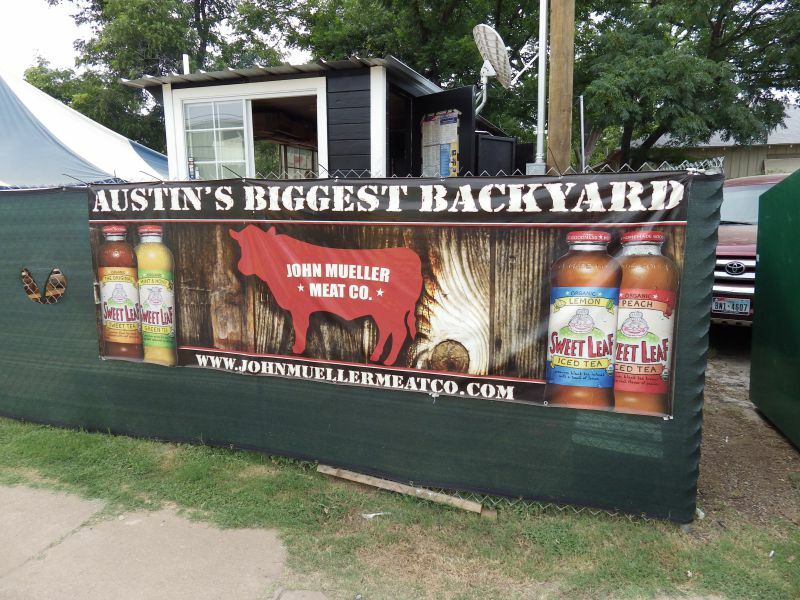 You can follow John Mueller and the official BBQ joint account on twitter and see some of his style, I think he’s a good guy and pretty damn funny at times. There is only one pit in service here and it’s pretty small for such a large volume place. He’s working that pit to its limit and beyond. I saw him putting fresh sausage on the smoker at 11:45am even though they shut down not long after lunch. 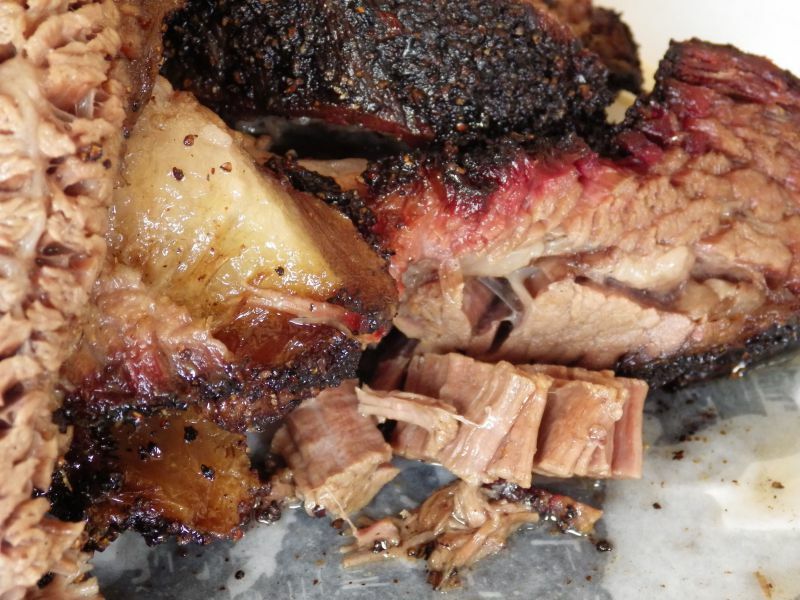 Franklin has multiple pits, and even la Barbecue has two. This man is the hardest working man in BBQ. 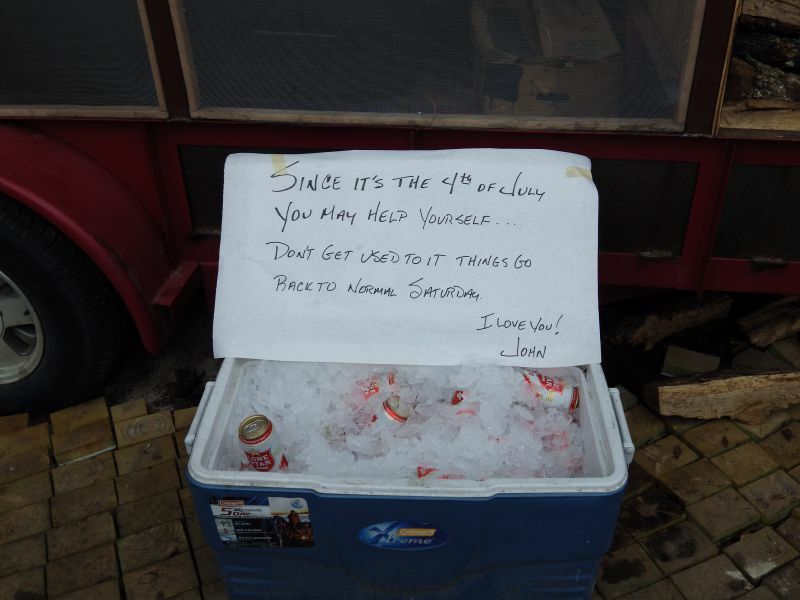 He even refilled the ice chest himself with more of that free Lone Star and ice. Thank you, John. After saying goodbye to family and friends we rode out to my mother in laws house to do a little more tech support. Keep your Java updated, folks. From there we followed Parmer lane out to Whitestone which becomes FM1431. A stretch of this road is rated “T1” by Butler Maps, which indicates it as one of the top rated motorcycle roads in Texas. 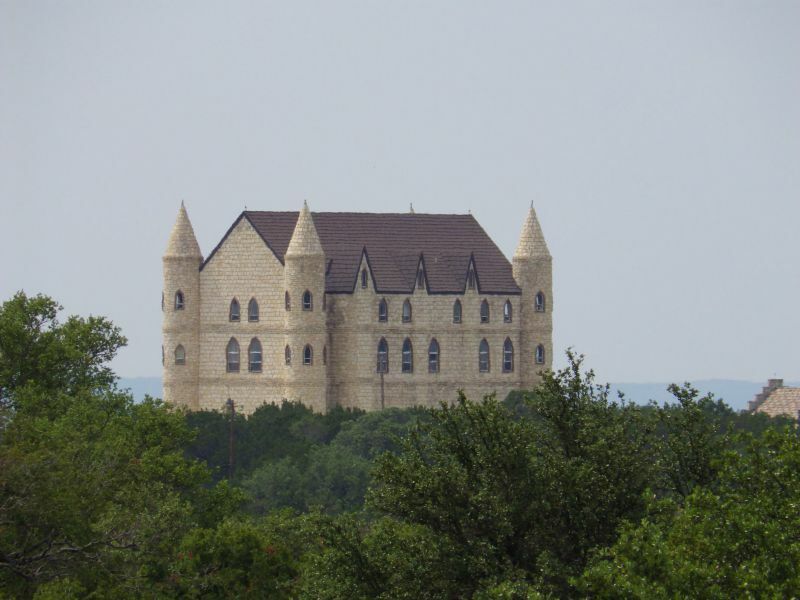 We followed the road as it twisted alongside Lake Travis until we arrived in Marble Falls. We stopped at the Blue Bonnet Café here which is a very popular motorcycle stop. 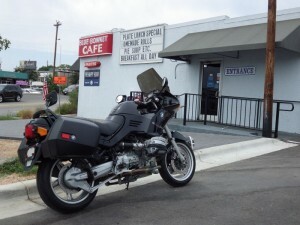 Similar to the Koffee Kup in Hico, Texas, Blue Bonnet is famous for their pies and we were in for a great deal as we arrive at 3pm in time for pie happy hour with half-priced pie. Knowing we were headed for more BBQ though we held ourselves to a single slice of delicious chocolate pie and a couple of ice teas to cool us off. I picked up a Butler map of the Texas Hill country here for future reference. From the café we headed north on U.S. 281 for a few miles and then turned onto Park Road 4 and ventured west. We made an unplanned stop at Longhorn Cavern State Park. As one would expect, its main feature is a cavern and tours are given at the top of the hour. 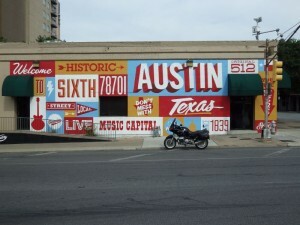 The cavern was used by Comanche Indians in the past and used as a Confederate stronghold during the Civil War. 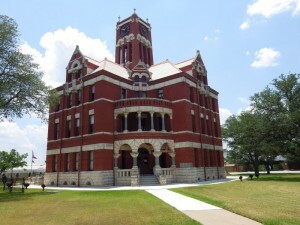 According to the website it was also rumored to be a hideout for local outlaw Sam Bass. The tours were reasonably priced but took an hour and a half to complete so we had to pass on the opportunity. We did make a loop around the park and saw some of the buildings that were built in the 1930’s and which still stand today. Back onto Park road 4 and continuing westward we made a quick photo stop near Falkenstein Castle. This modern castle was built after a visit to a European castle in 1995. The castle is not available for tours, it is only available for weddings. We continued along Park Road 4 and the curves began to tighten after making the descent past the castle. We stopped for several photos here, first above Devil’s Water Hole at Inks Lake where we could see boats, swimmers, and sun seekers playing below the cliffs. We saw vibrant pink granite glistening in the landscape. 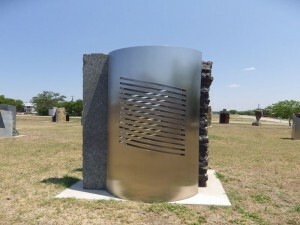 The granite for the current Texas State Capitol building was sourced from this area. From here it was a short ride down TX 29 across the Buchanan Dam and into the small city of Llano where we stopped at Cooper’s. 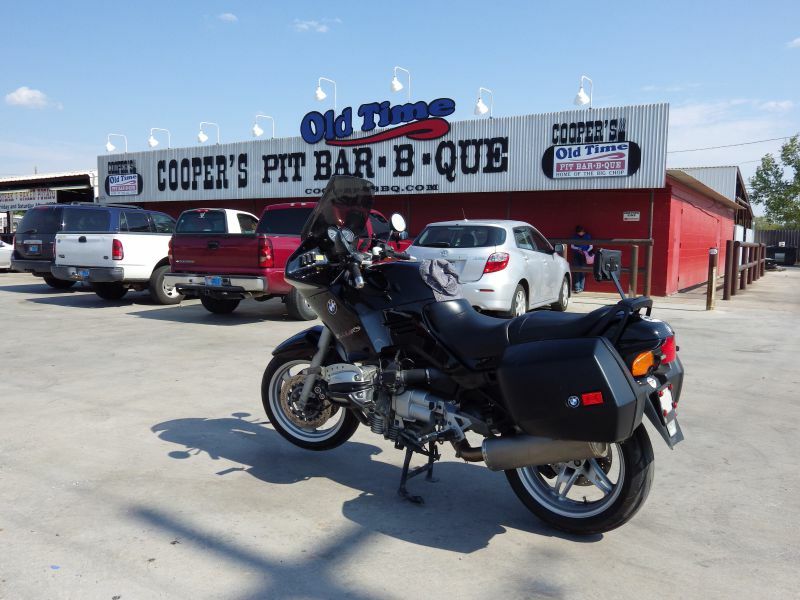 Cooper’s has three locations but they all differ slightly. We visited the Llano location. Not quite as far out in the country as Mason, Texas but not in the city like their Fort Worth joint, this location is in a transitional area of the hill country where the terrain changes from the marble and granite outcroppings near the Highland lakes to the more arid landscape of west Texas. One of the popular things at Cooper’s is an offer to “dip” your meat in sauce when you order it. They take tongs and dunk you entire piece of meat into a vat of sauce. I almost yelled at the poor kid who offered to dip my brisket, halting him from sinking our half pound of meat into that vat of tomato based sauce with strong hint of pickle juice. The cooking style here I call “ranch style” and others have used the term “cowboy style”, it is more of a west-Texas type of cooking rather than other parts of Texas. They use rectangular pits like those in Lockhart and Luling but they lack a fire box. 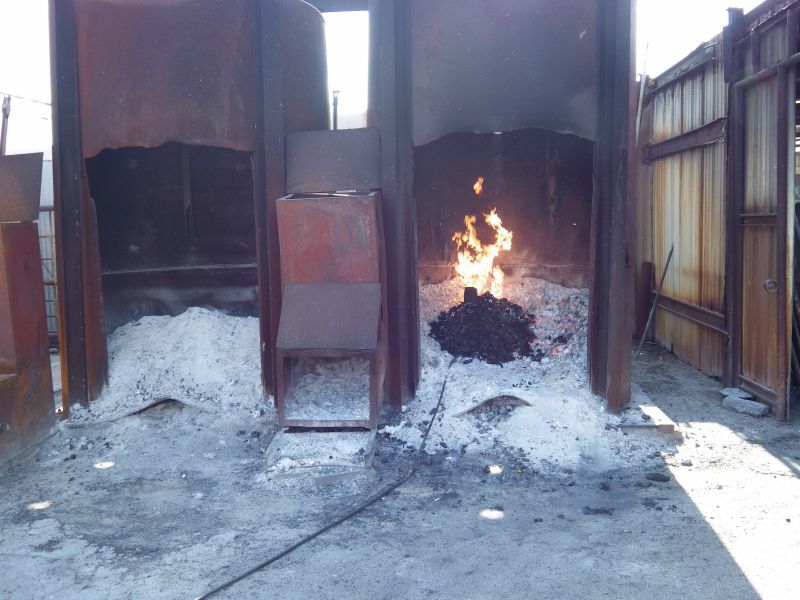 Wood (mesquite is used here and is common in West Texas) is first reduced to coals in dedicated upright “pits” used only for this purpose. 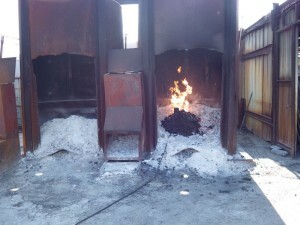 These coals are then transferred into the rectangular cooking pits and placed underneath the meat. This is direct type cooking rather than indirect smoking. It cooks the meat faster and doesn’t provide the same type of dark smoke ring that comes from true smoking. Brisket is the meat that is most different when using this type of cooking; everything else handles this pretty well. This type of cooking also works well for steaks and you will commonly see them on the menu alongside brisket and other BBQ meats. At Cooper’s you order from the warming pit where all of the finished meat is displayed just outside the dining room. 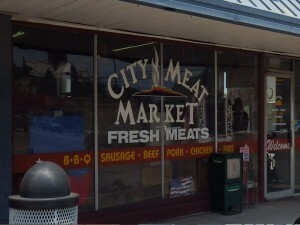 After getting your meat you enter the main dining room and select sides cafeteria style. Long picnic tables are laid out with loafs of bread, jars of jalapenos, a few hot sauces, and the requisite paper towels. Beans are free and additional sauce is set up next to the drink station. Cooper’s really surprised us though. My last experience with a direct cooked brisket was less than satisfactory but the first bite into the salt-heavy crust actually gave us both a little of that magic tingle. The exterior fat was nicely rendered and the outer portion of the brisket was great. Deeper towards the middle though the faster cooking style showed it’s weakness. There was no smoke flavor, and the fat was not fully rendered. It was still pretty tender and good but I have been spoiled after eating the best briskets in the world. I did like the salt-heavy rub as a changeup from the norm but overall I’m hooked on the thick cracked pepper based rubs. Cooper’s might sneak into my top 10 for brisket. The value was fair, too. I have heard people talk negatively about their prices but $13 a pound is cheaper than the $16 that is the going rate for most of the elite joints these days. The sausage here didn’t excite us at all though and that hurt my overall ratings for Cooper’s. I tried only the regular and passed on the jalapeno as I was still in a semi-coma from eating so much bark and fat at John Mueller’s. The sausage was finely ground and tasted like store bought to us. I also passed on some other options that might have raised my rating such as their pork chops or a big steak. 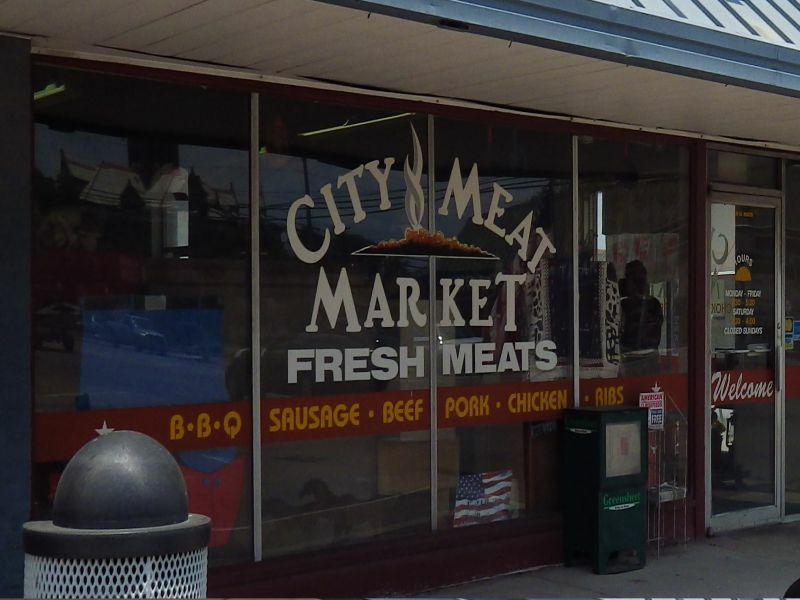 I had a long chat with one of the pit tenders outside and he said they sell large quantities of the meat, rubs, and sauces from their mail order business. 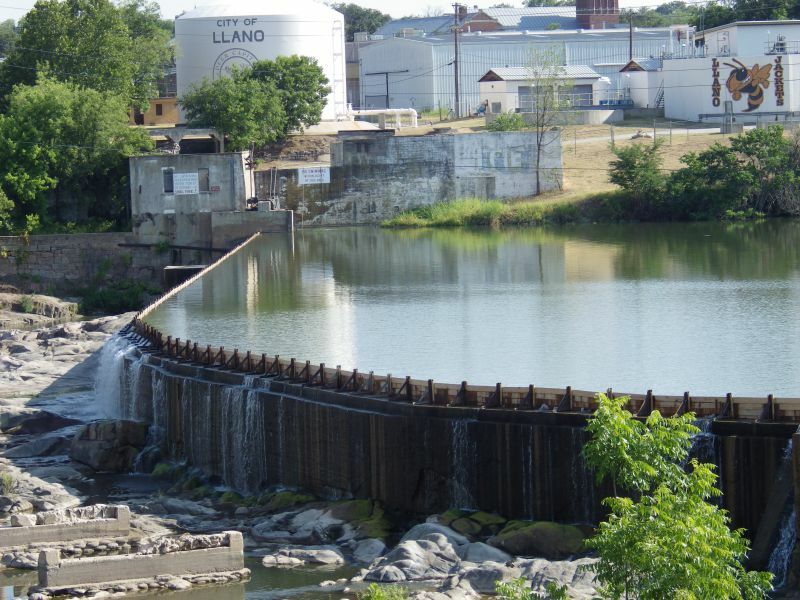 We also talked a bit about the laid back atmosphere of Llano. While he told me they did have a line at 10:30 and there probably would be another one for dinner, it just seems everything is kicked back a notch here. That’s what I love about Texas; when you get out of the big cities and slow yourself down you begin to get a real feel for Texas. Sometimes it takes a day or too but I felt it in just that little time as we talked while looking out at the hills in the distance and listening to the wind blowing through the trees. 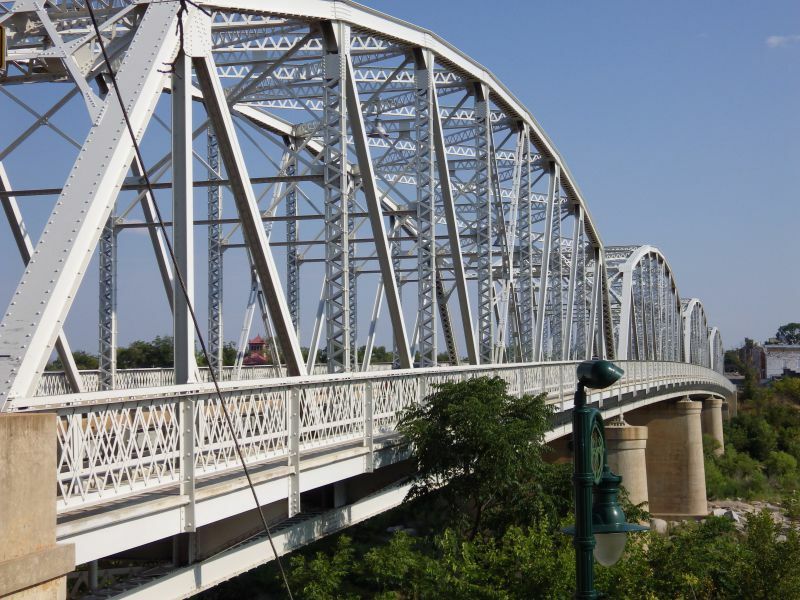 We saddled up and rode into downtown Llano to check out another “Texas Main street city”; small towns in Texas where remnants of storefronts of a hundred years or more still call in visitors and residents. Many have been converted to antique or kitsch stores but you can still get that old town vibe walking around. 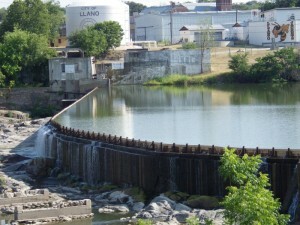 We made quick stops at the Lllano river dam and bridge, and took a few shots of the courthouse. It always reminds me of the old Andy Griffith TV show and I want to get to a point in my life where I can settle down and base myself out of a town like this. We made pretty much a bee-line back to Georgetown following TX 29 up to Ronald Reagan/Palmer. I stopped to visit my parent’s gravesites in Liberty Hill for a bit and then continued on. We traveled south to FM 1431 to check out a Goodwill where Leslye picked up a purse and then we headed over to IH 35 and back north to Georgetown where our hotel was. After cooling off for an hour or so we walked outside just in time to watch the fireworks that were at San Gabriel park. One we remembered in particular was a nearly perfect heart which we both enjoyed as we were also celebrating our 10th wedding anniversary. Another one that really impressed us was a perfectly shaped star; its amazing how well they can make designs now. 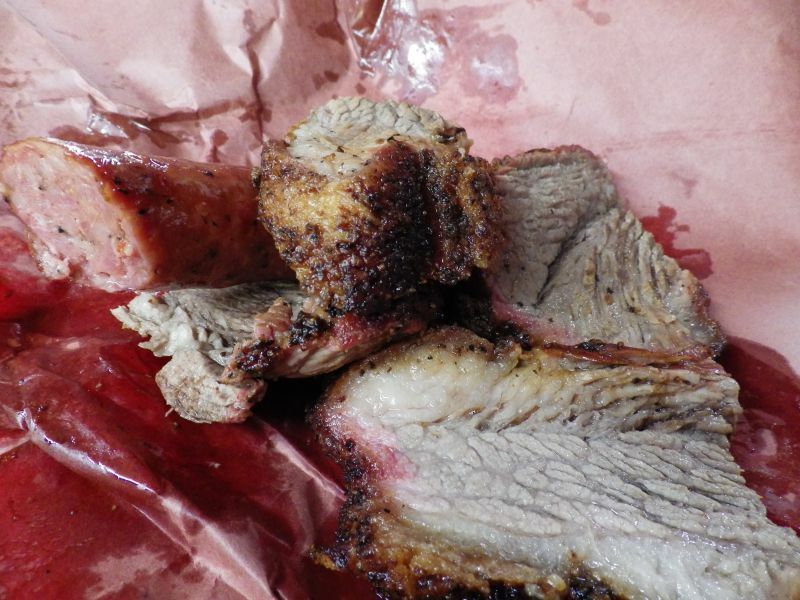 BBQ aficiandos recall the first time they had amazing brisket. Not good brisket, not great brisket, but absolutely amazing brisket. That first time you get the magic tingle and when you realize that there are but a handful of joints that can achieve such transcendental brisket. My first time was at Louie Mueller and I was excited to be back. I had now experienced brisket at dozens and dozens of other joints in the past few months and was ready to get back to the place that I thought had the best brisket around. We got there at about 10:40 and the line wasn’t bad. I walked around back while waiting and checked out their outdoor pit. It’s a custom pit built by Klose and looks like it gets plenty of use. 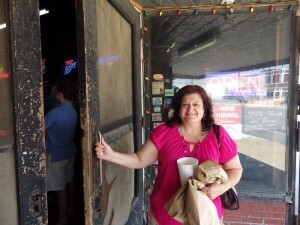 By the time they opened my sister had driven in from Austin and got in line with us. 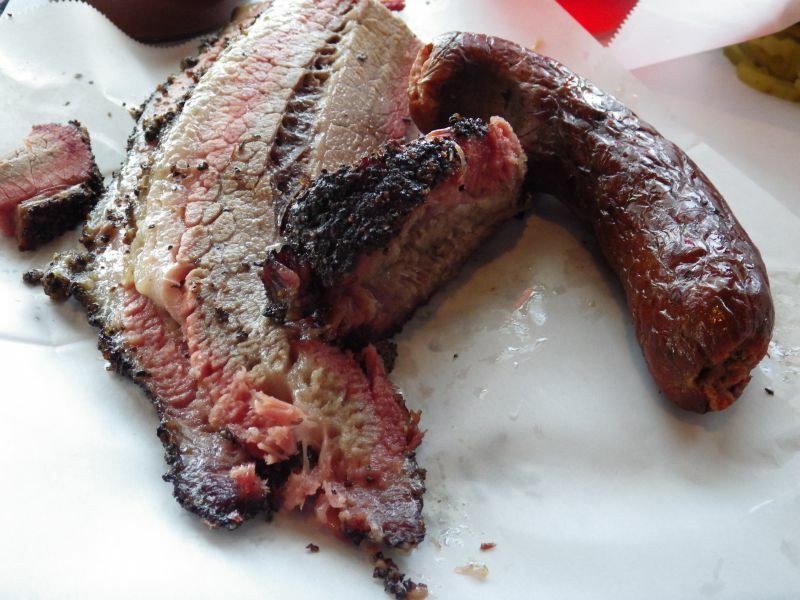 I ordered up my usual brisket and sausage and then got to use my Q Card for the first time. This card is sold online through the Man Up BBQ blog team and offers specials at BBQ joints mostly in Texas but even in some farther reaches of the world as well. The special here was a free peach cobbler including Blue Bell ice cream with purchase. I won’t go into a lot of the details of the building since I have done that in the past, but there is plenty of history here. 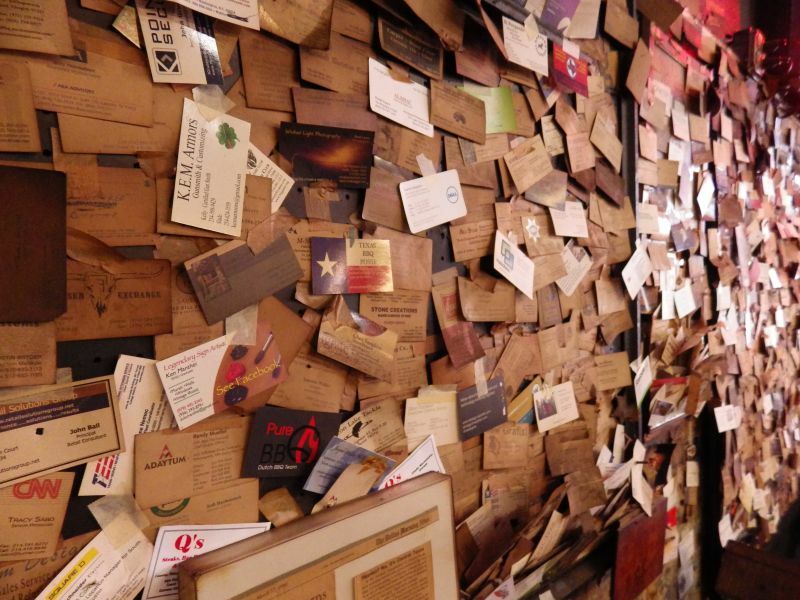 I always like the smoke-covered business card wall (I spotted Texas BBQ Posse’s card) and spending a little time checking out the numerous awards and signed photos hung around the main dining room. The BBQ was top notch although we felt like was just under the quality of our last visit. It is still one of a small selection of truly elite BBQ joints and it was not disappointing by any means, it just wasn’t as phenominal as our memory of the previous visit. 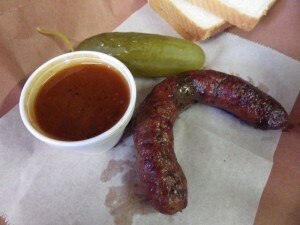 The Chipotle sausage is one of my favorites and I had that as well as a bite of my sister’s lean brisket. The peach cobbler was a great way to round out a meal but eating dessert in addition to all the BBQ is going to make me fat. 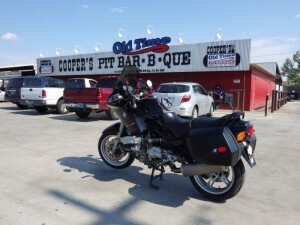 It’s only 47 miles following the shortest route between the two towns but we wanted a little time to digest our meal so I planned a stop in Coupland, Texas and I tacked on about 10 more to our route by taking the back farm-to-market roads rather than the most direct path. I found an interesting stop in Coupland, Texas. The Huntington Sculpture Foundation sits at the corner of Hoxie and Broad streets in this tiny town. 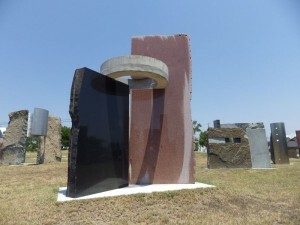 On the grounds of the site stand dozens of granite sculptures. Some with stainless steel and a very few with other material. One can walk through, examine, and explore the art at any time. I walked around and tried to ‘get’ the art while Leslye was trying to take some relief in the shade. 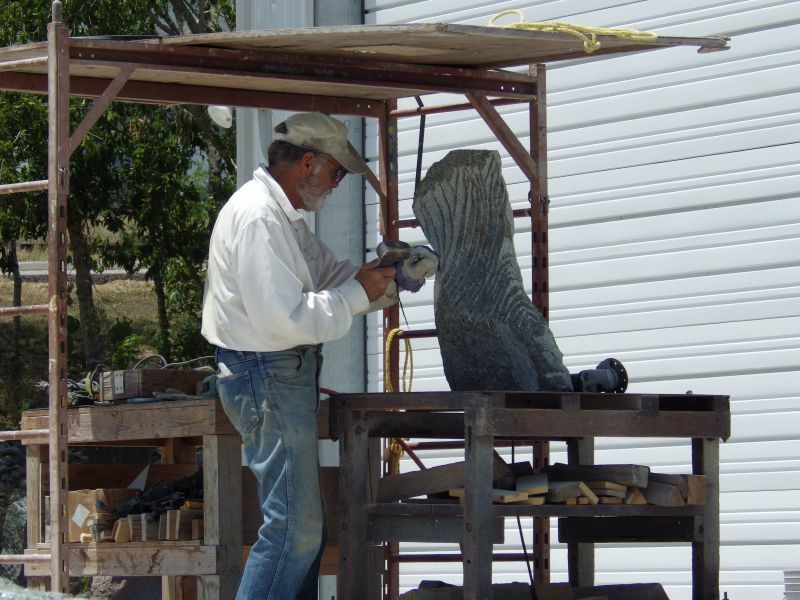 I watched the artist working in the driveway of his studio for a few minutes and again that “Texas feeling” returned. There was no sound of traffic or other big city noise, just a soft breeze with the occasional sound of hammer and chisel. After a few taps he would pause and examine his work, then continue. I thought this was just amazing in that an artist could devote his life to focus on art and do so in such a location without the distractions of a big city. I’m envious of Jim Huntington much more so than a millionaire businessman. You can read more about him and his art by clicking here. 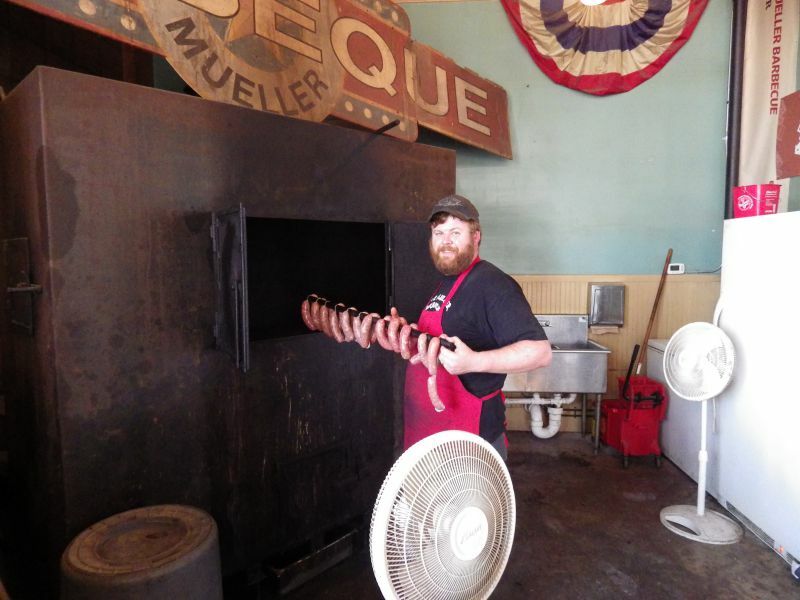 l would like to be able to say more about Giddings meat market but by extending the time between Louie Mueller and here we missed out on the brisket. This was entirely my fault, and when you arrive at 2pm that is what can happen. They had more brisket on the smoker which would be ready around 4pm or so but we couldn’t wait that long. I would much rather have this be the case than have a joint keep leftover dried out brisket on the cutting board all day. The reviews from others and their placement into the Texas Monthly Top 50 will have me revisiting so I can try the brisket but on this day we just had a sausage wrap. What I can tell you is the sausage wrap was good. It was a tad dry but well smoked with a beefy flavor and course grind. I’ll be back to check them out again. 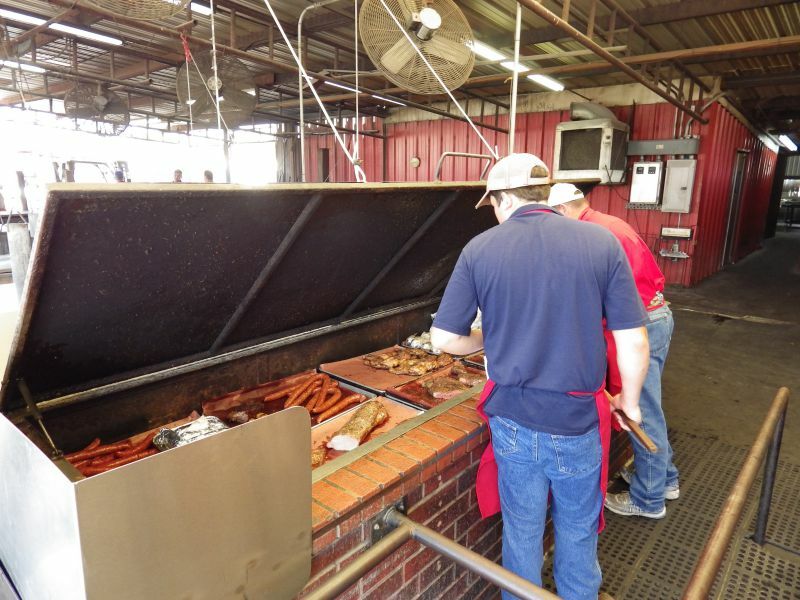 Tags: Cooper's, Giddings City Meat Market, John Mueller, Louie Mueller.